The following morning, I head home early. Having selected from memory some of the most inappropriate music we could think of for a wedding, we searched the internet for further contenders. While we were doing so, I suddenly half-remembered a piece of music played at the funeral of my dear friend Alan, who died many years ago from cancer. For years I’d meant to chase up and identify it. I’d never heard it before Alan’s farewell and it had a tremendous impact on me. I was so stupified by emotion and the sudden overwhelming sense of Alan’s presence it wrought that I just listened in a trance to everyone else sing the unfamiliar words on the song-sheet provided for all his heathen friends. 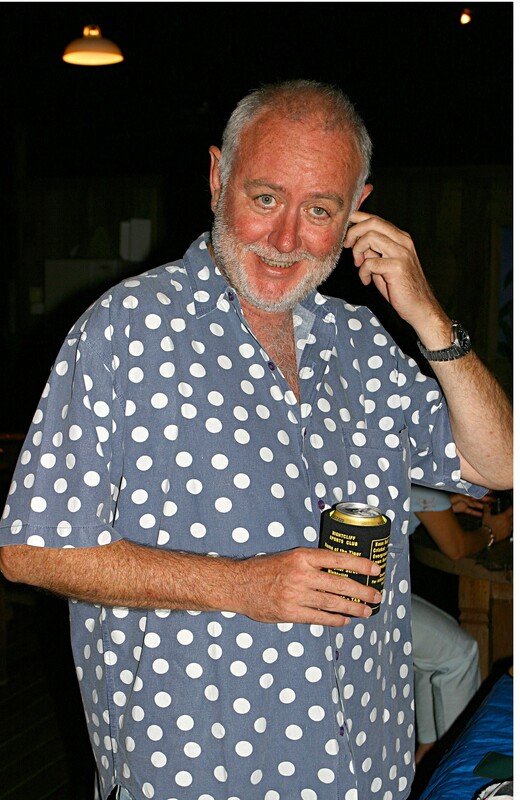 Alan MacLachlan, 2003. In death, still larger than life. After much head-scratching and googling, I recalled someone telling me after the service that Johnny Cash had done a version. Suddenly it was easy to hunt down, via his discography. ‘How Great Thou Art!’ When I get settled at the computer now, I want to hear it again. First up, however, is a Youtube version performed on ‘Songs of Praise.’ As soon as it begins, I burst into tears. They stream down my face for several minutes until the piece ends. What’s going on? Is it remembering Alan – or my wonderful Irish friend Larry from St Girons who went the same way last year? He’s been on my mind, too, since I got my diagnosis. Or am I weeping for myself, unspoken fears welling up from the depths? Or is it the unexpected encounter with the Sublime, as manifested in the hymn? A delayed response to yesterday’s non-news? Or the accumulated emotions of the last week? Whatever, I haven’t cried like that since receiving the news in 2010 of the death of Kimwaga, my beloved childhood minder in Tanganyika. Kimwaga and I in Tanganyika, around 1957. 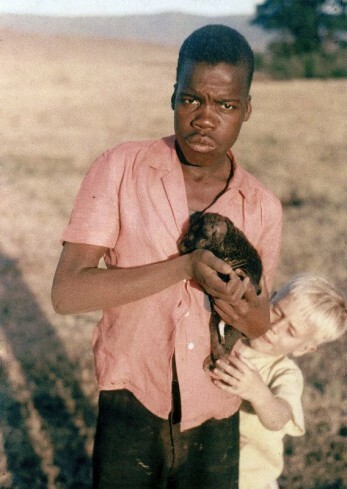 He’s warily holding a hyena cub, which may have become one of our menagerie of temporary pets. Anna phones soon after to check how I am and we talk it through. I soon feel better and can get on with the day. Not so Anna. Alarmed by my fit, she determines to hassle Chelsea and Westminster to make sure I get the new scans done later today or tomorrow. Several hours later, she reports back. It’s taken this long to get through. As part of the Tory deregulation of the NHS, a single, under-staffed switch-board now serves seven hospitals, including C and W. The operator didn’t know who to try, especially as we only know the forename of the surgeon who called yesterday, Pippa. Eventually, Anna managed to contact Urology in C and W. There was just a voicemail and she left her details. Eventually, an administrator rang back, assuring her I’d be contacted as soon as the appointments were made. More frustration. I feel it as strongly on Anna’s behalf as my own. I wish she’d not wasted so much of her time. I so want her get back to the last chapter of her book and knock the thing on the head. Doing so would give her the kind of focus and distraction I’m getting from this blog. But she’s less cold-blooded than I am. So far I’ve little but good to say of the NHS. Apart from the time lost because of Easter, I’ve had an excellent experience. But suddenly I have a stab of real anxiety, not just about the latest delay, but about how easy it would be to get lost in the constantly ‘reformed’ bureaucracy of the NHS, as many have before me. In the early evening, I have an appointment with my local G.P. He’s an amiable locum, from Rumania, replacing my normal doctor while she’s been on maternity leave. We go over the blood tests I had last summer and he reiterates that everything was normal, including renal function. Had the tumour been present then, he assures me, something would have shown. Apparently this wretched thing must have implanted itself since August. But I have doubts still. Following one of my blood tests at C and W, Doctor Dave told me that I had good renal function. The tumour doesn’t seem to have interfered with that. I guess that G.P.s can’t be expected to have the knowledge of specialists, so I decide to leave it until I’ve had my surgeons’ meeting. Dr. Ruhiga is genuinely sympathetic and expresses his condolences as he writes me a sick note for work and one for the insurance companies from which I’ll have to claim for my cancelled trips to Palestine / Israel and Denmark. He assures me that if I have any immediate problems, I’m simply to call him at the surgery, not feel obliged to come in. ‘Multumesc!’ I thank him as I leave. My one word of Rumanian always makes him smile. And then, long after I’d thought it was way too late, I’ve been blessed with a family, something else to occupy me and help me grow, even in retirement. It’s difficult to express what having a little girl means to me. Everyone who has (had) one will know what I’m talking about. In my case, there’s added relish because Maddy arrived so belatedly and unexpectedly in my life. I know what it’s like to lose a father while still a child. It’s certainly one of the reasons I never had any of my own all these decades. I was just too afraid that they might have to experience the utter desolation I went through for several years (no such thing as counselling in the macho 1960s.) Now I realise all the more forcefully that I have to conquer this malady for her sake – as well as for Anna’s. Besides, I am NOT going to be cheated of seeing Maddy grow up into the beautiful woman she will undoubtedly become. Anna’s sister Kate is going to take Maddy for a sleepover with her beloved cousin Tara in Balham, so we’re able to enjoy another evening alone, just the two of us. I’m beginning to see the upside of this illness! I make spelt pasta with vegetables and halloumi cheese and after dinner, we set to work on the blog. With her experience of writing one, we make good progress, though there are lots of things that we can’t work out (hers is hosted by her college.) I’m going to have to contact my friend Ben, who lives up the road. Even more than Sally, he’s the master of all things techie and I’m sure he’ll be able to tie up the remaining loose ends. Before we go to bed at mine, I take a glass of water with some tincture of turmeric. My Brazilian friend Deni recommended it for the arthritis in my left forefinger (no doubt from too much time at the key-board.) It’s been sitting in the cupboard ever since I bought it, rational scepticism overcoming my temporary interest in ‘alternative’ remedies. It’s one of the basics of ayurvedic medicine, I remind myself. If it works on arthritis, perhaps the tumour won’t like it either or will at least stop demanding sugar. Let’s see what happens to my finger first over the next few days…. Previous Previous post: Wednesday 08 April: Of being In Limbo. Next Next post: Saturday-Sunday 11-12 April: Of boredom, banality and boosts to morale.